One of the most important archaeological sites that attracts the gaze and admiration of the whole world! The birthplace of the Olympic Games! From here starts the message of the Olympic idea, the flame that marks the beginning of the modern Olympic Games. 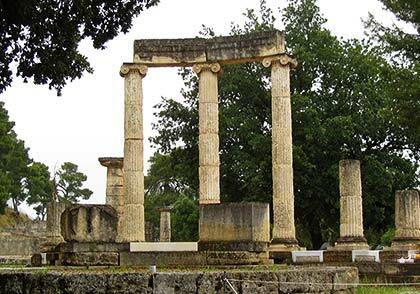 Ancient Olympia is on the list of UNESCO’s World Heritage. A visit to this unique region of western Peloponnese is a charming wandering in a glorious past, a walk among the great monuments in beautiful natural surroundings, which makes today's visitor to relive the days of celebrations and competitions of antiquity. 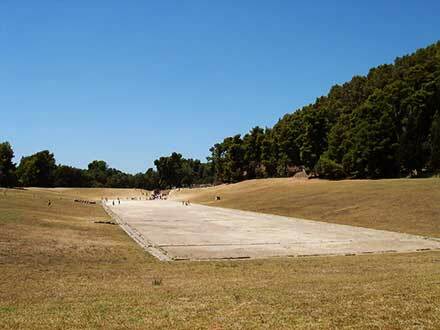 Ancient Olympia is located in the western Peloponnese, in the district of Elis, east of the capital, Pyrgos. The archaeological site lies in a green environment south of the hill Kronion, near the confluence of the river Alpheus with its tributary Kladeos. 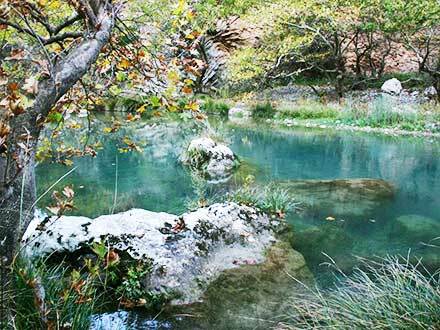 The Alpheus is the longest river in the Peloponnese. Its length is 111 km and originates in Arcadia, near the village Vourvoura. Flowing towards the coast of Elis receives the waters of the rivers Elissonas, Lucius, Ladon, Erymanthos and Kladeos and empties into the north side of Kyparissiakos bay forming necks and lagoons, as Agoulinitsa, Mouria and Caiaphas. Ancient Olympia is 23 km from Pyrgos, the capital city of Elis, 114 km from Patras and about 310 km from Athens, where we can go passing, after Corinth either from Patras, either from Tripolis. 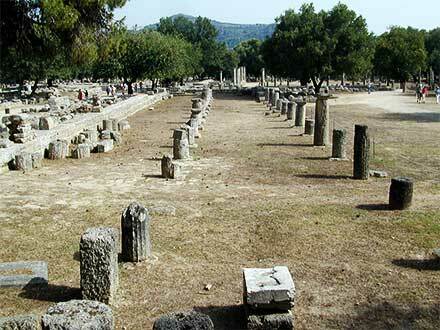 Near the archaeological site is the current municipality of Ancient Olympia with hotels, restaurants and all amenities. During the tourist season is linked with a local train to Pyrgos and the harbor of Katakolo. 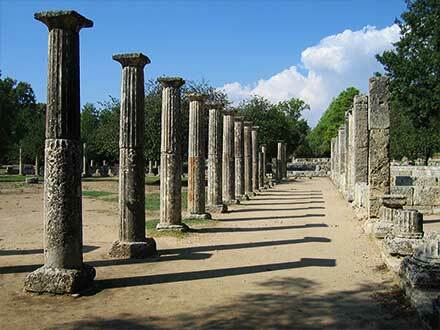 The train station of Ancient Olympia is located 300 meters east of the city center. Information: tel. 26240 22677. In Pyrgos: Train Station tel. 26210 22576, Bus Station tel. 26210 20600. The area offers many options for excursions to monasteries and other attractions, hiking in mountainous areas and alternative activities in the rivers of the region. Important sights are in all directions –the ancient Elis, medieval castles, the temple of Epicurean Apollo at Vasses, the waterfalls of Neda and others. West, across the coast of Elis, with endless beaches, there are many possibilities for a pleasant stay and nice short or long vacations. 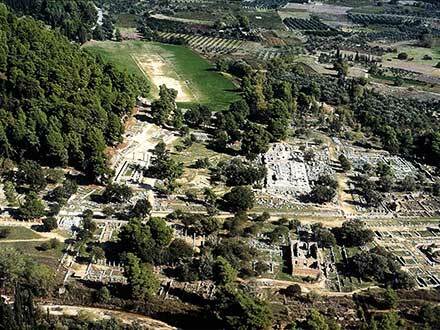 Olympia, in the region of Elis, in western Peloponnese, was one of the most important sanctuaries of antiquity, dedicated to Olympian Zeus, father of the gods. It was located in an area with low hills from which passed Alpheus, the longest river in the Peloponnese, and its tributary Kladeos, south of Kronion hill, place of worship of Saturn, father of Zeus. It was named Sacred Altis (grove), because the land was verdant mostly with wild olive trees. Pottery found on the north side of the Stadium show that there was a residential installation since at least 2700 BC. Residues after 2000 BC have been also identified –foundations of arched buildings near Heraion and Mycenaean tombs in the area of the new Archaeological Museum. During the Mycenaean era, north of Olympia, in the valley of the river Peneus, they lived the Epeans. According to Pausanias, the first king was Aithlios. His son Endymion organized a running race, in which his sons Paeon, Epeus and Aitolos participated; the prize was the throne of the kingdom. Winner was Epeus, from whom the residents took their name. The Epeans participated in the Trojan War led by Polyxenes. 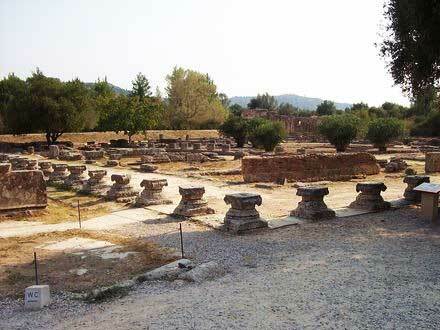 Olympia, in the region of Alpheus River, belonged to the town of Pissa. In a deep ravine an oracle was established, in which Gaia (Earth) was worshiped –as it happened originally in Delphi. According to the beliefs of the time, such exposures of the soil brought to the surface the supernatural forces hiding in the bowels of the earth. The opening slowly was closed, but the cult remained. According to mythology, one of the kings of Pissa was Oenomaus, who had a beautiful daughter, Hippodamia. According to a prophecy, he would lose his throne and his life by the husband of his daughter. So he demanded of anyone asking to marry her to take part with him in a chariot race knowing that his horses were undefeated. But when Pelops appeared, with the intervention of Hippodamia, Oinonaos was betrayed by his charioteer, Myrtilus, and was defeated. Pelops married Hippodamia and became king. 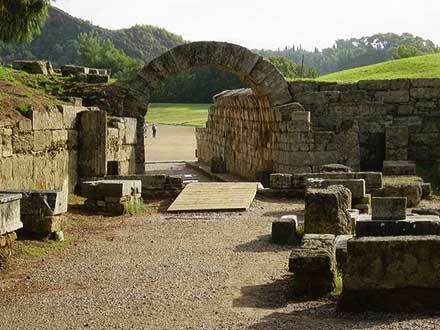 At that time, after 1200 BC, belongs the first evidence that there was a worship center in Olympia. In the tumulus of Pelops, the Pelopion, near the northwest entrance of the sanctuary, a cenotaph from 1100 BC has been discovered. The oldest votive offerings, from the 11th and 10th century BC, show that near Pelopion, ​​during the early Geometrical years, chariot races were taking place in honor of Pelops. They were the first games at Olympia. According to the traditions of Pissa, founder of the sanctuary and the games was the demigod Hercules. In 1200 BC, when the Dorians invaded in Southern Greece repelling the Achaeans, the Eleans reached western Peloponnese from Aetolia in western Greece, led by Oxylos. They repulsed the Epeans and were settled in the valley, which took their name. The southern boundary of their kingdom was Alpheus River, while the residents were forced to move south. Thus, three kingdoms were founded; Elis, Pissa and Trifylia further south. The sanctuary was at the limits of Elis and Pissa, and became a field of intense conflict and wars between them until the 5th century BC. The city of Elis, having prevailed at the beginning, imposed the worship of Zeus, but did not abolish the cult of Gaia. According to tradition, the Olympic Games were founded by its first king, Oxylos, and reorganized by king Iphitus starting in 776 BC. The reorganization was an ambitious plan to make Olympia a place in which athletes and spectators would come from all Greek cities. Its success was based on “sacred truce”, established when Iphitus concluded a peace treaty with Lycurgus, king of Sparta, and Kleosthenes, king of Pissa. The sacred truce acquired a Panhellenic character. Every conflict between Greek cities stopped while heralds from Elis announced everywhere the call of Zeus to participate in the Games of his sanctuary. 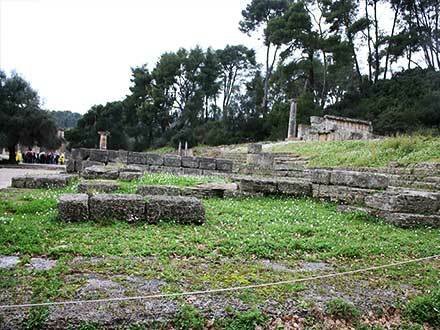 Olympia quickly became a Panhellenic center, but the city of Pissa did not stop claiming the Sanctuary. In 668 BC, it dominated again undertaking the organization of the games, while the ally town of Skillous built a temple dedicated to Hera. It was the first building in the Sanctuary. Until then there were no temples or other buildings in the Sacred Altis. The grove was developing around the tumulus of Pelops and the altar of Zeus, formed from the ashes of the sacrifices and the votive offerings –mostly bronze tripods, cauldrons and weapns– were placed in trees and pedestals. 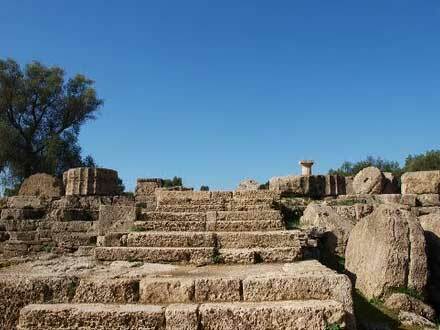 In 600 BC at the site of the first temple the inhabitants of Pissa built a new, larger temple also dedicated to Hera. But in 588 BC a new war broke out. In 572 BC, the Eleans regained the sanctuary with the help of the Spartans and sought to overcome their opponents in the organization of the games. They built Prytanion and Bouleuterion, while at the same time different cities built the Treasures, small buildings like temples where they kept their votives. The games originally were held in front of the altars and lasted one day with one competition, the running. Gradually other disciplines were added, the duration reached five days and the first Stadium was formed. In the 5th century BC Pissa again claimed the Sanctuary, but finally in 464 BC Elis prevailed and destroyed Pissa. In the 5th and 4th century BC, the fame of the Sanctuary and the glamor of the Games reached their highest point. Olympia was enriched with majestic buildings and works of great artists and in conjunction with the sanctity of the place, became a Panhellenic intellectual, cultural and political center. The city of Elis was considered sacred and inviolable territory. Within the Sacred Altis, protected by a wall (perivolos), were the main religious buildings and offerings, while the residences of the priests, the facilities for the preparation of athletes, the baths, the hostels and other facilities were located outside the enclosure. In the middle of the 5th century BC a new stadium was constructed on the same site with a capacity of 40,000 spectators. In 456 BC the temple of Zeus, the biggest in mainland Greece, was completed built by the architect Livon of Elis. 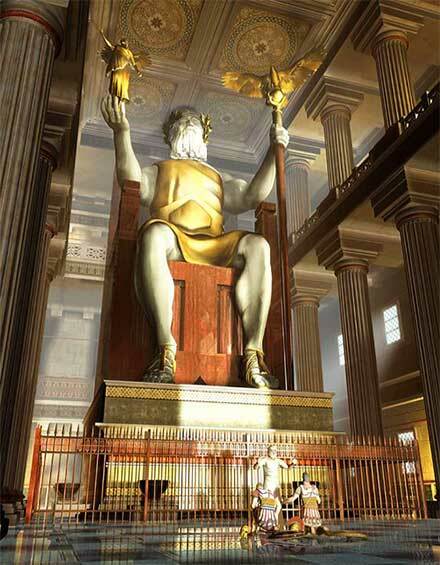 Within the temple the famous gold and ivory statue of Zeus was placed, with a height of 12.40 m with its pedestal, a work of the great sculptor Phidias. In the 4th century BC they were built, among others, the Metroon –the third temple of the sanctuary– the Stoa of Echo and the South Stoa, while the Stadium was reconstructed, but was moved a little further east (later it took the form we see today with the Crypt, the vaulted entrance built in the Hellenistic period, and the additions made ​​in Roman times). But the decline began. In 364 BC the sacred truce was violated when the Eleans fought against the Arcadians inside the Altis, while began appearing in racing corruption cases in the Games began to appear, as evidenced by the “Zanes”, bronze statues of Zeus made ​​of the fines imposed on athletes for breaking the rules. After his victory in the battle of Chaeronea in 338 BC, Philip the 2nd of Macedonia built the Philippion. In 312 BC, Telesphoros, general of Antigonus, king of Macedonia, looted the sanctuary. The last great constructions, in the 3rd and 2nd century BC, were the Leonidaeon, the largest building of the Sanctuary for hosting prominent visitors, built at the expense of the rich Leonides from Naxos, the Palaestra and the Gymnasium. During the Roman era they were built the Nympheum, sponsored by Herodes Atticus, baths and an aqueduct. The Olympic Games were held every four years in honor of Zeus. From their beginning, in 776 BC according to tradition, until their abolition in 393 AD, 291 Olympiads took place. Only one Olympiad, the 211th, was delayed two years by order of Nero. The games originally lasted one day. The unique event, the chariot, was replaced by the contest of running one stadium (192.27 m). First winner was Korivos from Elis. In 724 BC, in the 14th Olympiad, the diavlos (double stage running) was added won by Ypenos from Pissa; and in the 15th Olympiad, the dolichos (24 running) won by Acanthus from Sparta. 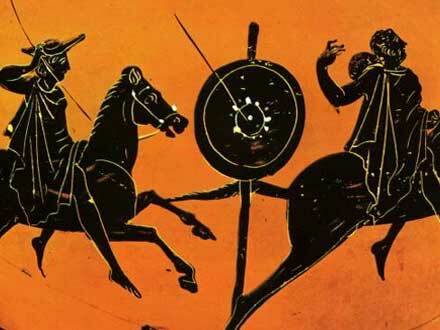 In 708 BC, they took place for the first time the contests of wrestling and pentathlon (one-stadium running, wrestling, javelin, discus, long jump), in 688 BC the first boxing won by Onomastus from Smyrna, and in 680 BC, in the 25th Olympiad, the four-horse chariot won by Pagondas from Thebes. First day: drawing and oath of the athletes, competition of trumpeters and heralds for the announcement of the athletes’ names, competitions of boys. 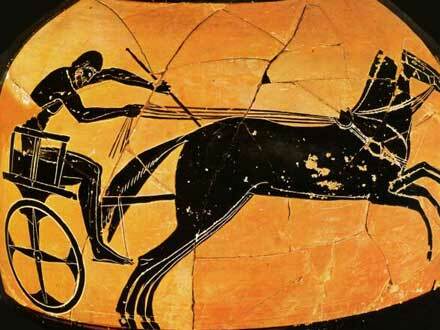 Second day: horse and chariot races, pentathlon and during the sunset, sacrifice in the Pelopion. 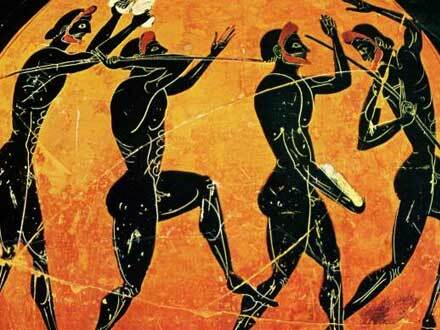 Third day: sacrifice on the altar of Zeus, running competitions (one stadium, diavlos and dolichos). Fourth day: wrestling, boxing, pankration and running of oplites (soldiers). Fifth day: prize to the winners. All together the winners, wreathed and holding a palm branch in their right hand, walked in the cheers of the crowd to the temple of Zeus, where the first of the Hellanodikes crowned them with the olive branch of the olive tree, which grew in the southwest corner of the temple. The ceremony was followed by sacrifices on the altars, lunch for the winners in the Prytanion and overnight entertainments. Every free Greek had the right to participate. Non-Greeks, slaves, and sacrilegious and killers were excluded. Women were also excluded. Only the priestess of Demeter Chamyne could watch the games from the altar of the goddess in the Stadium. The winners were regarded as heroes and depicted in statues. The organization and supervision of the games belonged to umpires (hellanodikes) from Elis. In the beginning they were two and finally twelve. The celebrations coincided with the full moon of the eighth month of the Elean calendar, about August. The athletes arrived in Olympia one month before the games and were training under the supervision of the hellanodikes in the gymnasiums of Olympia and Elis. The subjugation of Greece by the Romans and the political decline at that time had a significant impact to the games, as the ideological element ceased to exist. All Roman citizens could participate and the games gradually turned into a show. In 86 BC, during the wars of Rome against Mithridates, King of Pontus, the consul Sulla, except Athens and Delphi, pillaged also Olympia and took works of art. Works of art were also taken by Nero, who acquired a villa in the sanctuary and was a winner of the games, as well as the emperors Tiberius and Germanicus. At the time of the philhellene Emperor Hadrian (117-138) there was a glimpse of the games, while buildings were repaired and expanded. In 267, the threat of the Heruli barbarians, who invaded Greece and destroyed Athens, led the authorities of the sanctuary to destroy most buildings and use the materials to build a wall for the protection of the temple of Zeus. But the Heruli did not arrive in Olympia. The 291st Olympiad in 393 was the last. The Olympic Games were abolished by Emperor Theodosius the 1st. It was the final of a series of orders for the elimination of the ancient worship. Two years later the gold and ivory statue of Zeus was taken to Constantinople, where later it was destroyed in a fire. In 426 Emperor Theodosius the 2nd ordered the destruction of the sanctuary and the temple of Zeus was burned. Shortly afterwards a small Christian village was founded, while in the laboratory of Phidias a Christian basilica was built. In 522 and 551 powerful earthquakes completed the destruction. The ruins were covered by the floods of the rivers Alpheus and Kladeos and the landslides of the Kronion hill. 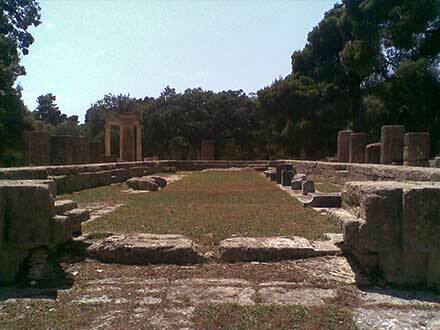 The Sanctuary of Olympia was discovered in 1766 by the Britton Richard Chandler. 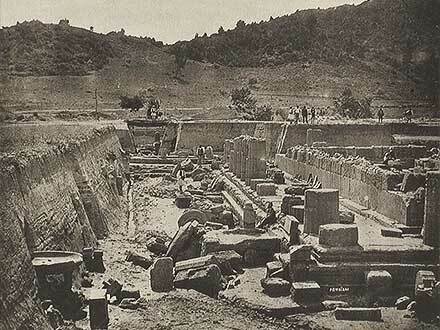 The first excavations were made in May 1829 in the temple of Zeus by French archaeologists, who participated in the Scientific Expedition of Moria (Expédition Scientifique de Morée), which accompanied the French Expedition Army in its campaign for the complete liberation of the Peloponnese. The findings were transferred to the Louvre Museum in Paris, but when the Greek government learned about it, the excavations stopped. In 1875 the German Archaeological Institute of Athens undertook the official excavations, led during the first period, 1875 – 1881, by Ernst Curtius. The first excavations were made in the central part of the sanctuary and brought to light important buildings, as well as and discoveries, such as the Nike (Victory) of Paeonios, Hermes of Praxiteles, and sculptures from the Temple of Zeus; a total of 14,000 items, which became the exhibition of the first museum, built in 1885. The second period of excavations was in 1908 – 1929. Excavations were made again in 1952 – 1966; this time in the workshop of Phidias, the building of Leonidaeon, the northern wall of the Stadium and the southeastern area of ​​the sanctuary. In one hundred and forty pits found many bronze and ceramic objects were found broken. New excavations in 1972 – 1984 brought to light evidence for dating the Stadium, findings from the Prytanion and tombs, while in 1984 - 1996 ​​excavations were made in the Prytanion and Pelopion. The archaeologists searched also elements for the evolution of the sanctuary during the Roman Empire. 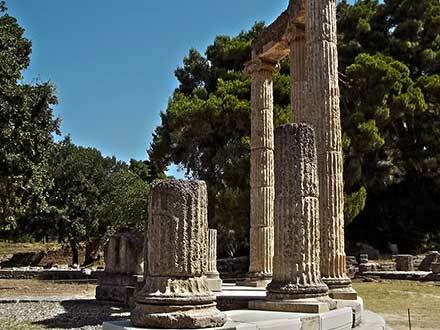 The tour to the Sacred Altis starts from the northwest side, where is the Propylon. You can also enter from the west and southwest side, but it is preferable to begin the visit from the main entrance and see the sites and monuments in order. The sanctuary was protected by a perivolos (enclosure). Inside there were the religious buildings and tributes. 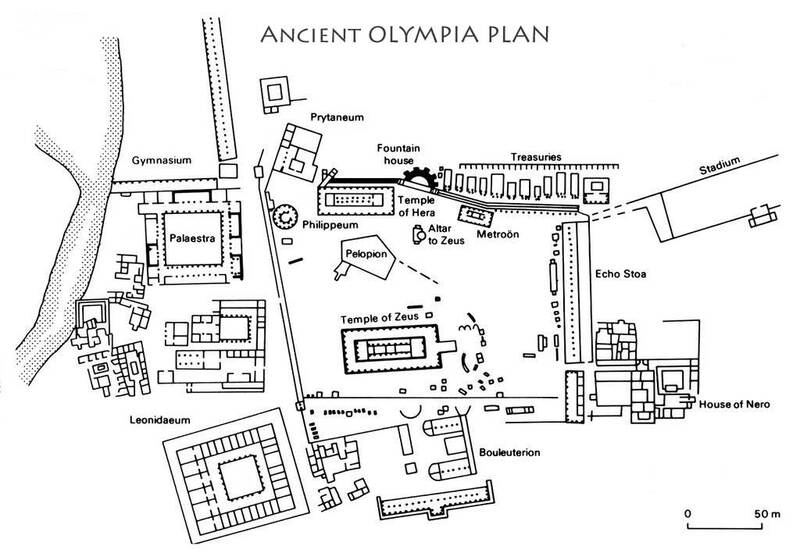 The houses of the priests, the guesthouses, the places for the preparation of the athletes, baths and other facilities were to the west, outside the precinct. The findings from the excavations are presented in the Archaeological Museum of Olympia. There is also the Museum of the History of Ancient Olympic Games and the Museum of the History of the Modern Olympic Games. The visit to the Sanctuary takes considerable time and during the summer it is better to have a hat and water. At the entrance there are fountains with water and in the Archaeological Museum a refreshment bar. Entering the Sacred Altis from the Propylon, the entrance at the northwestern side, built during the Roman era, we see to the left the remains of the Prytanion. In ancient Greece the Prytanion was the place where the officials of the city met. Inside the sacred fire of the goddess Hestia was burning. 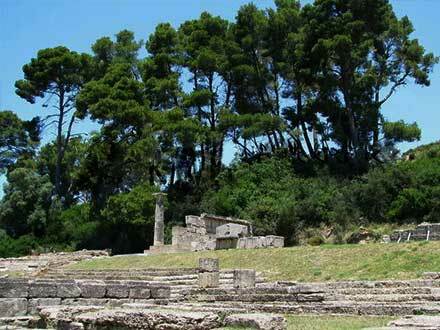 The Prytanion in Olympia was built in the 6th – 5th century BC. Additional works have been made during the Hellenistic era, followed by modifications during the Roman time. We can see the foundations of an inner square room with the altar where the sacred fire burned of the Eleans was burning. On the north side there are the foundations of a peristyle and on the west side the foundations of rooms, where the galley and dining places. In the Prytanion the principles of the sanctuary offered the lunch which followed the ceremony for the winners of the Olympic Games. Opposite is located the Philippion. It was built by Philip the 2nd, king of Macedonia, after his victory at the battle of Chaeronea in 338 BC. It was a circular building with a diameter of 15.24 m, built by the Athenian sculptor Leochares. The exterior colonnade had 18 Ionic columns. Inside there were 9 Corinthian semi-columns and a semicircular pedestal with 5 gold and ivory statues of the Macedonian royal family. Next to the Prytanion, to the east, is located the Heraeon, the oldest temple dedicated to the goddess Hera in Greece and the first building in the Sacred Altis, built in the Archaic era, when the sanctuary was for a time under the sovereignty of the city of Pissa. The first temple was built in the 7th century BC by the inhabitants of the city Skillous, ally of Pissa. In 600 BC the inhapitants of Pissa built a new temple. It was a Doric temple with dimensions of 50 x 18.75 m and a height of 7.50 m. It had six columns on the short sides and 16 on the long sides; wooden initially, they were gradually replaced by stone columns. The cornice was wooden and the upper part of the walls of bricks. The pediments were decorated with capes in a disc shape with a diameter of 2.5 m; one is exhibited in the Archaeological Museum of Olympia. Two colonnades divided the interior into three naves. Inside, according to the traveler Pausanias who visited Olympia in the 2nd century AD, there were the statues of seated Hera and standing Zeus with helmet. At that time the temple was used for the storage of older statues and tributes. In this temple the statue of Hermes of Praxiteles was discovered. An Archaic stone head belonged to the statue of Hera. 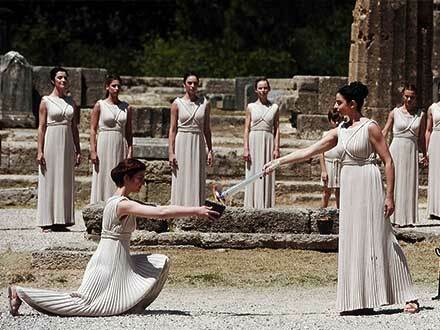 In our time in front of the temple of Hera starts the ceremony of the Olympic flame for the modern Olympic Games, with the reflection of sunlight in a parabolic mirror. In front of the Heraeon are the remains of the Pelopion, the tumulus of Pelops, the oldest monument in Olympia in honor of Pelops, who won the chariot race against Oinomaos, king of Pissa, married his daughter Hippodamia and took the throne. The tumulus was a hillock, with a diameter of 31 to 34 m and a hexagonal enclosure. In the 5th century BC on the west side a porch was added, repaired in the Roman era. 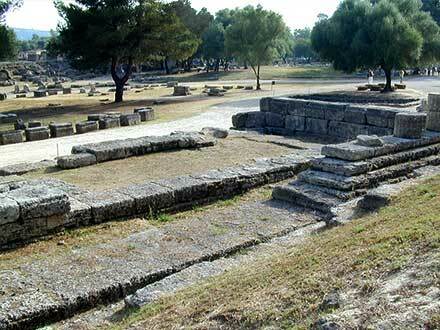 The findings in Pelopion confirmed that there was a cult center in Olympia from 1200 BC. There is a cenotaph dating 1100 BC, while the oldest offerings in the Sanctuary from the 11th and 10th century BC lead to the conclusion that near Pelopion chariot races were held in honor of Pelops; they are considered the first Olympic Games. Beside the Heraeon, to the east lies the Nymphaeum, or Exedra (platform) of Herodes Atticus, built in Roman times at the expense of Herodes Atticus, the sponsor of great works also in Athens and Delphi. The Nymphaeum was a semicircular construction covered with marble. On the back side, which was higher, there were niches with statues of members of the donor’s family and Roman emperors’ families. The water reached lower a cistern, with circular colonnades on its edges. After Nympheum is the foundation of the Treasuries. Behind it, at the foot of the Kronion hill, were the Treasuries, small buildings like temples, dedicated by Greek cities in the Sanctuary of Zeus, where they kept mobile their dedications. The Treasuries were built in the 6th century and early 5th century BC. The foundation was built after 330 BC. From left to right we see the foundations of the Treasuries dedicated by the cities of Sicyon, Syracuse, Epidamnos, Byzantium, Sybaris, Cyrene, Selinus, Metapontium, Megara and Gela. The oldest is the Treasury of the Sikyonians, one of the most famous Treasuries of antiquity, restored by the German archaeologists who discovered many architectural members scattered in the sanctuary, while some were used in newer buildings during the Byzantine era. In front of the foundation of the Treasuries is the Metroon, the temple of the Mother of the Gods, the third in chronological order temple of the sanctuary, built in 400 BC. It was a Dorian temple with dimensions of 20.67 x 10.62 m and a height of 7.50 m. It had six columns on the short sides and 11 on the long sides. During the Roman era it was dedicated to Augustus. East of the Treasuries is the Crypt, the vaulted entrance of the Stadium, which was only for the umpires and athletes. It was built when the western bank of the stadium was formed during its reconstruction in the 4th century BC and in the Hellenistic era, in the 3rd or 2nd century BC, was covered with an arch. It had a length of 32 m, a width of 3.70 m and a height of 4.45 m.
On the east side of the sanctuary is the Stadium as it was formed after the third phase of its construction. The first Stadium was founded in 560 BC, when the events of the Olympic Games were gradually increased and their duration reached five days. In the middle of the 5th century BC a new stadium was constructed in the same position. It was reconstructed in the mid-4th century BC a little further east. The first two Stadiums were located at 80 m west into the Altis and 9 m further south of the third. It had a capacity of 40,000 spectators and took the form we see today after the construction of the Crypt in the Hellenistic era and additions made ​​in the early Roman era. On the four sides there are mounds and around the track still exists the stone pipe water. There are also the stone lines of the starting and ending points. The track has a length of 192.27 m; an Olympic stadium or 600 feet. On the south side there is the Tribune of the Hellanodikes with seats, while opposite is the altar of Demeter Chamyne, where the priestess of the goddess watched the games, the only woman who had this right. In front of the entrance of the Stadium are pedestals, on which the “Zanes” were placed, the copper tatues of Zeus which began to be made in the 4th century BC with the fines of punishing the athletes for corruption. Near the Stadium is the Echo Stoa, built around 350 BC, called originally Pikili Stoa, because its walls were adorned with painted decoration. 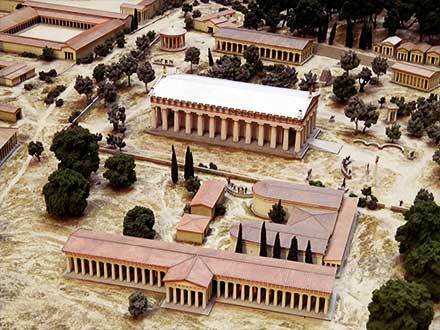 It had a length of 96.50 m and a width of 12.50 m, with 44 Doric columns. Inside there was an Ionic colonnade with rooms towards the Stadium. South are the foundations of a building named Southeastern Building, which was perhaps the Prytanion of the city of Pissa; a large part of it was destroyed to build the House of Nero, the villa of the Roman emperor who was a winner of the Games. In the heart of the sanctuary is the Temple of Zeus, the second temple chronologically in the Altis. It was built in the Classical era of the inhabitants of Elis with the spoils of the second victorious war against Pissa in the middle of the 5th century BC. The temple was completed in 456 BC. The architect was Livon of Elis. It is a Doric peripteral temple, with 6 columns on the short sides and 13 on the long sides. The columns had a height of 10.51 m and a diameter of 2.21 to 2.25. It was the largest temple in mainland Greece with a length of 64.12 m and a width of 27.68 m. It was built from local stone, coated with white marble powder to give the impression of marble. It consists of the vestibule, the nave and the opisthodomos (back side). The entrance, on the east side, was approached by a ramp. The sculptures of the decoration, of Parian marble, are among the finest examples of the so-called strict rhythm of rhe early classical sculpture and one of the great landmarks in the history of ancient Greek art. In the eastern pediment is depicted the myth of the chariot race between Oenomaos, king of Pissa, and Pelops, who won, married Hippodamia, daughter of Oenomaus, and took the throne. Zeus was also depicted in the center. 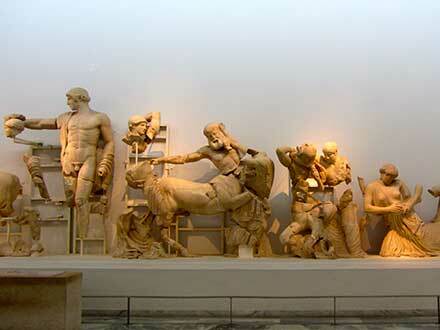 In the west pediment is depicted the battle between the Centaurs and Lapiths with Apollo as a central figure. The vestibule and the opisthodomos had two columns and friezes with twelve metopes, in which the twelve labors of Hercules were depicted for the first time in a complete form. The diccovered sculptures are in the museum of Olympia. The main temple is divided into three naves with two colonnades of seven columns. The middle nave is twice in width of the two on the sides; above there was a gallery from which visitors could admire the famous gold and ivory statue of Zeus. The temple was set on fire and destroyed in 426 by order of the Emperor Theodosius the 2nd. 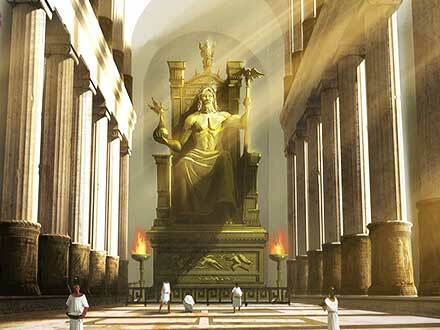 Inside the temple of Zeus was the famous gold and ivory statue of Zeus, one of the seven wonders of the ancient world. It was created in 432 BC by the great sculptor Phidias (490 – 430 BC) in his workshop in Olympia and had a height of 12.40 m with its podium, which had dimensions of 6.65 x 9.93 m.
Zeus was sitting on a throne of ivory, gold, ebony and precious stones with rich sculptural decoration with mythological scenes, painted by Panaenos and Kolotis, students of Phidias. The bare parts of the body and the face were of ivory, the eyes of precious stones, the hair and beard of gold, like the garment, while the olive branch which crowned the head was of green enamel. Zeus was holding in his right hand a little gold and ivory statue of the goddess Nike (Victory) and in the left hand a scepter with an eagle. In the gold sandals was the inscription “Φειδίας Χαρμίδου υιός μ’ εποίησε Αθηναίος” (“Phidias, son of Charmides has created me, the Athenian.”). Pausanias mentions that, when Phidias finished, asked Zeus if he liked it and the god replied with a thunderbolt which passed through the temple without damage. At the point where it struck a bronze urn was placed. In the early 2nd century BC some crevices in the statue were repaired by the sculptor Damofont of Messenia. After the abolition of the Olympic Games in 393 by Theodosius the 1st, the statue was transferred in Constantinople, where in 476 was destroyed in a fire. East of the temple of Zeus are the foundations of several buildings and the triangular pedestal, on which it was placed the statue of Nike of Paeonios, great sculptor of the classical era. The pedestal is preserved in a third of its original height of 9 meters. According to an inscription, the monument was created by Paeonios from Mende (city of Chalkidiki) and was dedicated by the inhabitants of Messenia and Nafpaktos as a tenth of the spoils of their victory over the Spartans in 425 BC. The statue of Nike, of Parian marble, with a height of 2.90 m, is considered one of the masterpieces of sculptural art of ancient Greece. It was found at the beginning of the excavations in 1875 and is exhibited in the Archaeological Museum of Olympia. It represents the moment when the goddess Nike reaches the earth with the tip of the toe of one foot on the ground. The garment covers the ankles, fastened high on one shoulder. According to the description of Pausanias the goddess held in one hand a palm branch and in the other a wild-olive wreath. Next on the ground was the head of an eagle, symbol of Zeus. South of the temple of Zeus is the Bouleuterion. It was built in the archaic era, in the 6th century BC, and was completed in the classical era. It was the seat of the parliament of Ilia, the seat of the hellanodikes of the Olympic Games and place where the archives of the games were kept. 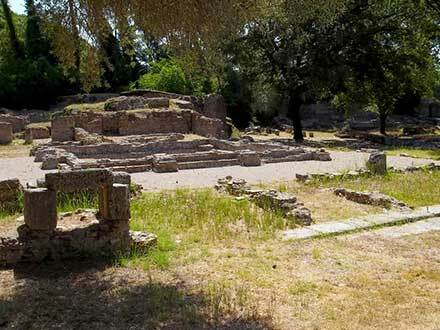 The foundations of two same arched buildings are preserved with an outdoor courtyard between them, in which was the altar of Orkios (Oath), where the athletes took the oath for the games; there is also an Ionic gallery on the east side. South from Bouleuterion is the South Stoa (Arcade), built in 365 BC. It was the monumental entrance to the Sanctuary from the side of the river Alpheus and had a length of 80 m with an internal colonnade of 34 Doric columns in south. Near are Roman Thermes and west of them, in the southwestern edge of the sanctuary, the foundations of the Leonidaeon, the largest building in Olympia. It was built in 330 – 320 BC, at the expense of rich Leonides, rich citizen of the island of Naxos, and was renovated in the reign of Emperor Hadrian. It was a majestic building for hosting distinguished guests, with dimensions of 80 x 73 m and rooms around a central courtyard with a colonnade of 44 Doric columns. The exterior colonnade was composed of 138 Ionic columns. North of the Leonidaeon, outside the enclosure of the sanctuary, are the remains of Roman guests’houses, two buildings developed around courtyards. 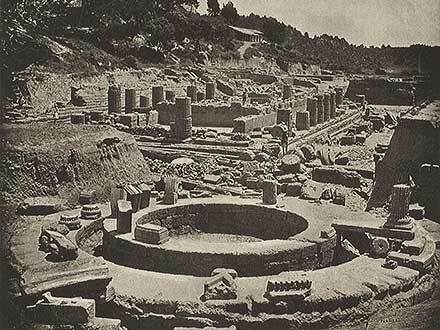 Next is the Workshop of Phidias, discovered under a basilica. They have come to light the foundations of the building where Phidias created the gold and ivory statue of Zeus, and rooms where clay molds, quantities of ivory, paints and other materials, and tools have been found; also, a clay wine-cup from 430 BC, in the base of which is the inscription ΦΕΙΔΙΟΕΙΜΙ (I am of Phidias). Near is the Theokoleon, the building where the priests of Olympia lived, built in the mid 4th century BC; it had eight rooms around a colonnaded courtyard. Ih the area there are foundations of baths from different eras. Near the bank of the river Kladeos walls of Roman baths are preserved, built in 100 BC, and further north the foundations of baths of the classical era. Near are the residues of a cistern. Further north is the Palaestra, built in the Hellenistic era, around 200 BC. It was a square construction with a side of 66 m. Around a central atrium were 19 rooms, used as dressing rooms, baths, training rooms and places for philosophers and orators. Just to the north is the Gymnasium, built shortly after. It had a length of 200 m, with a portico on the southeast corner and Doric galleries on the four sides for the training of runners and throwers. 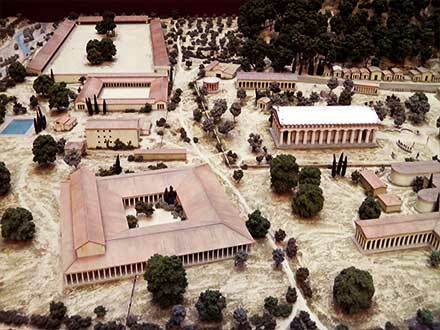 The Archaeological Museum of Olympia is one of the most important museums in Greece. The permanent exhibition of the findings from the excavations it the Sacred Altis gives us the opportunity to witness the history of the area from the Early Bronze Age to the early Christian period, in the 6th – 7th century. 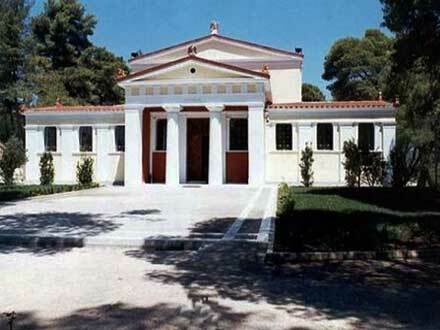 The first museum, the Old Museum as it is called, was housed in a neoclassical building built in 1885 on the hill west of the Altis, with a donation of the national benefactor Andreas Syngros, called in his honor “Syngreion”. Over time, however, there were damages from earthquakes, while the excavations continued bringing to light new findings. Thus, in 1966 – 1975 the New Museum was built, inaugurated in 1982 by Melina Mercouri, then Minister of Culture. 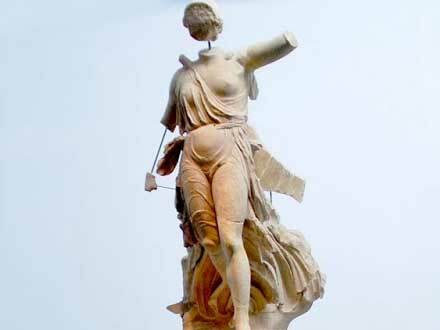 Only the Nike of Paeonios was exposed in 1994, because the pose of the statue was difficult and took time. On the occasion of the Olympic Games in Athens in 2004, the museum was reformed and expanded, the exhibition was presented in a new way, a refreshment bar was constructed in the east side and the shop was installed in a specially designed building between the museum and the archaeological site. The exhibition place consists of the vestibule and twelve rooms. Texts, drawings, maps, photographs, representations and models of monuments help the visitor during the visit. Room I: exhibits from the prehistoric era –pottery and stone tools mainly from 2700 - 2000 BC, representation of the tomb of Pelops in the center of the room and findings from the Mycenaean era, 1600 – 1100 BC, from chamber tombs discovered in the area of the museum (clay, stone, bronze objects and jewelery). Room II: findings from the Geometric and Archaic era –the collection of bronze objects, offerings in the sanctuary, only a part of the museum’s collection, which is the richest in the world (including human and animal figurines, cauldrons, tripods, helmets, greaves, markings of shields and elaborate armors); also, the clay cape preserved fro the Heraeon and the archaic stone head of Hera. Room III: findings from the Late Archaic era –pottery, bronze jewelry and utensils– and some of the most important architectural elements, such as the pediment of the Treasury of Megara and the cornice of the Treasury of Gela. Room IV: severe style works, like of statue-cluster of Zeus and Ganymede, a battering ram, the helmet of Miltiades and two helmets of Hieron. 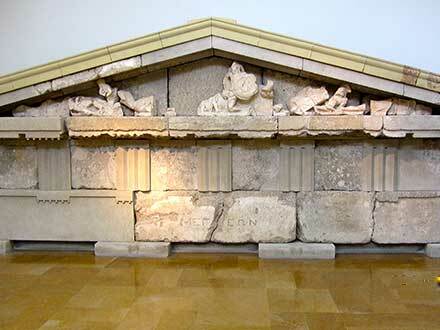 Room V (large central hall): the sculptural decoration from the pediments and metopes of the temple of Zeus. Room VI: the statue of Nike of Paeonios. Room VII: findings from the Workshop of Phidias (molds, tools, pottery and the famous cup of Phidias); also a painting representation of the gold and ivory statue of Zeus, the model of the workshop and other objects found in the workshop. Room VIII: the statue of the famous Hermes of Praxiteles, protected by a special system against earthquakes. Room IX: findings from the Late Classical and Hellenistic era –pottery, sculptures and architectural elements. Rooms X and XI: the collection of Roman sculptures, of which stand out the statues of the Nymphaeum of Herodes Atticus, arranged in such a way to resemble their original position on the monument. Room XII: findings from the 2nd until the 6th – 7th century AD, when the area ceased to be inhabited (clay, bronze, iron and glass objects). The Hermes of Praxiteles is considered the greatest finding of Olympia and the only existing authentic original work of the great sculptor. 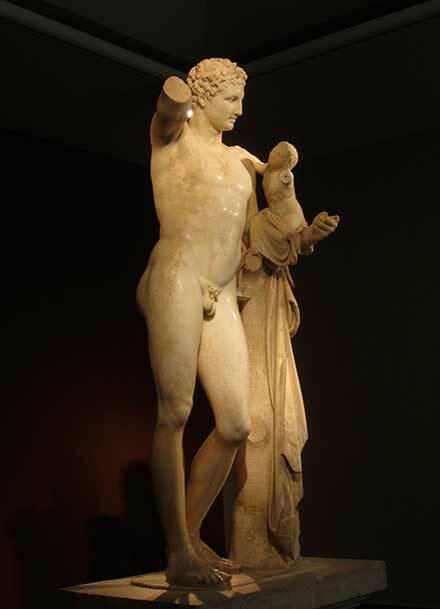 The statue of Hermes with the infant Dionysus was created in 330 BC of Parian marble and has a height of 2.10 m. It was found in the temple of Hera in 1877. It was dedicated by the inhabitants of Elis and Messenia after a peace treaty. The work is inspired by the myth of Semele, who, while she was pregnant, motivated by the jealous Hera, asked Zeus to appear before her with his thunders, and when he appeared, she died from fear. Zeus took the infant Dionysus and sent him with Hermes to the Nymphs in Crete to nurture him. Hermes is presenting while he is resting during the long trip. According to experts, in the strong wavy line given by the artist in the body, in the plasticity with the use of shadows and in the distant expression of the face, with a subtle melancholy, they are expressed the fluidity, the emotional distress and the disillsionment, which prevailed in the late classical times. In the hair, the garment and the sandals are traces of the original colors. Some repairs have been made in the Roman era. In the Museum of the History of the Olympic Games in Antiquity are exhibited 463 works from the Sanctuary of Olympia and other places of Greece, from the 2nd millennium BC to the 5th century AD. The exhibits are divided into thematic sections. Among others are: gold rings-seals from the Mycenaean era with the first depictions of competitions, bronze and clay figurines of warriors and chariots, which are the first representations of chariot races in Olympia in historical times, sport instruments (disks, dumbbells, and others), inscribed bases of statues of athletes in the Sanctuary, stone and bronze inscriptions, bronze figurines of athletes and many vases depicting athletes. In the Museum of Modern Olympic Games there are exhibits of the contemporary history of the Olympic Games, from the first Games in Athens in 1896 until today. In Olympia there is also the monument of Pierre de Coubertin, the inspirer and leader of the modern Olympics, who died in 1937.